Phaplu Sallery to Mera peak Trekking and a Climbing route is less crowded. It makes the journey unforgettable experience. Mera peak is located south of the Everest in the Hinku valley and it is relatively quite easy to climb the peaks. This ultimate Himalayan trekking and climbing holiday begin with a short and exciting flight to Phaplu in the Lower Solu-Khumbu. From here, we begin trekking through the terraced farmland and forest of Nepal's 'Middle Hills', passing small villages and settlements inhabited by the hardy Sherpa. Phaplu to Mera Peak Climbing route is getting more popular each year due to the extraordinary and stunning scenery it offers. Moreover, you do not need any previous mountaineering experience if you are physically fit and have an enthusiasm for adventure. Neither has it demanded technical climbing. This is the highest peak allowed for climbing in Nepal. The climb is definitely a strenuous one being the highest peak, but the slopes rarely exceed 30 degrees and hence it is technically straightforward. 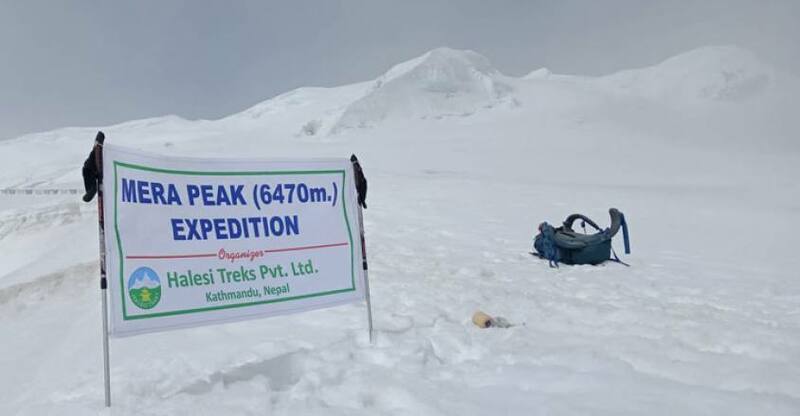 Phaplu to Mera peak Halesi Treks Pvt. Ltd has designed this trip for adventure lovers and it was given one a proper acclimatization and hiking experience. 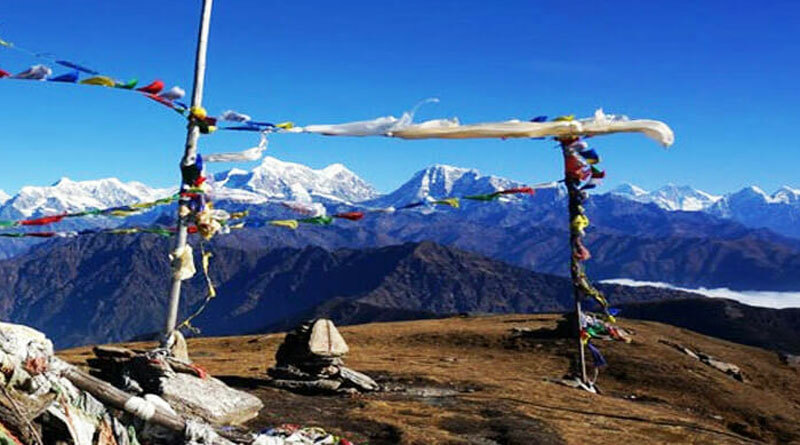 Mera peak climb via Phaplu takes you from the lowland to the top of Mera peak with slow, gradual and interesting increase in the altitude which makes the trip more safer from altitude sickness, fun and adventurous. Mera Peak at 6476 meters, is one of the highest trekking peaks in Nepal and its summit panorama takes in five of the world's 8000-meter peaks - Kangchenjunga, Makalu, Lhotse, Everest and Cho Oyu. 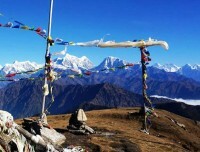 Mera peak summit is a stunning viewpoint for 5 of the world's 8000-meter peaks. Fly to Phaplu Khare to Lukla Helicopter and fly out from Lukla. 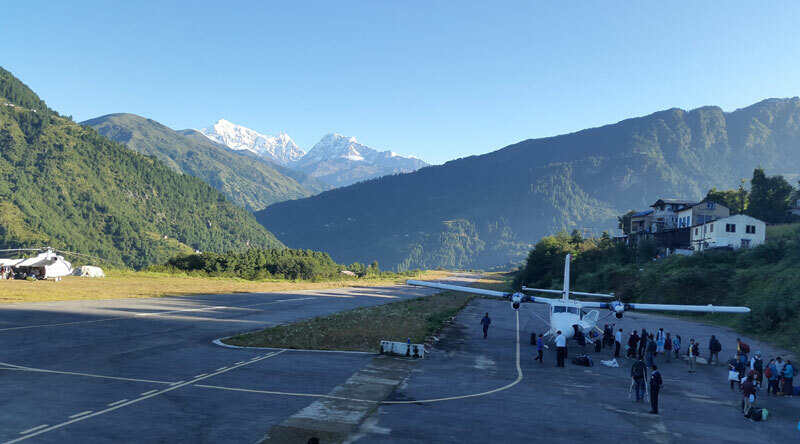 Day 02: Early Morning Flight from Kathmandu to Phaplu and Trek to Ringmu: (2500m) 4 /5 hrs. 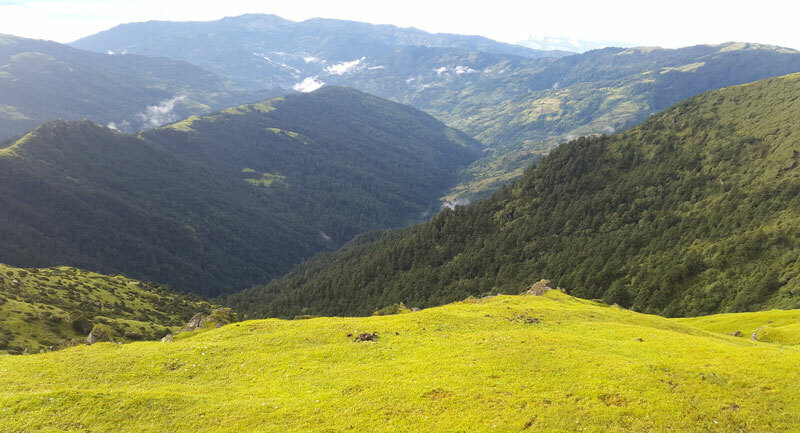 Day 03: Trek from Ringmu to Nunthala (2200m.) 4 hrs. Day 04: Trek from Nunthala to Khari Khola (2010M) 4 /5 hrs. Day 05: Trek from Kharikhola to Pangkongma (2846M) 4 hrs. Day 06: Trek from Pangkongma to Ramailo dada( 3250m) 5 / 6 hrs. Day 07: Trek from Ramailo dada to Chhatra Khola ( 3160m) 6 /7 hrs. Day 08: Trek from Chhatra khola to Kothe (3500m) 5 /6 hrs. Day 10: Trek from Kothe to Tangnag ( 4350m) 4/5 hrs. 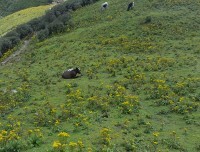 Day 11: Trek fromTangnag to Khare ( 5000m) 4 /5 hrs. Day 12: acclimatization and skills training day. Day 13: Trek from Khare to Mera Peak Base camp ( 5300m) 3/ 4hrs. Day 14: Trek from Mera peak base camp to High camp (5800) 3 /4 hrs. Day 15: the Mera peak summit (6476m). Descend to Khare. 10 / 12 hrs. Day 16: Khare to Lukla by Helicopter. Meet our representative at the airport and then you will be transferred to hotel. and will brief about the trip. You should clear your dues before we proceed for the trip. overnight at hotel. Early morning 30 minutes flight from Kathmandu to Phaplu The sights from the plane are amazing, providing dramatic views of terraced hills and the distant Himalayan giants. After landing in the village of Phaplu, we meet the rest of our staff and porters. 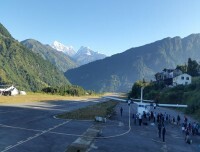 The Phaplu is the small airstrip in Solukhumbu; we start very few treks from Phaplu. When you get down from a plane, you can see an excellent view of Sherpa town and Numbur/Khatang/Kerolung. 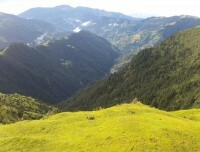 The Trekking trail follows Chiwang and Phera through a pine tree and rhododendron forest alive with birds. 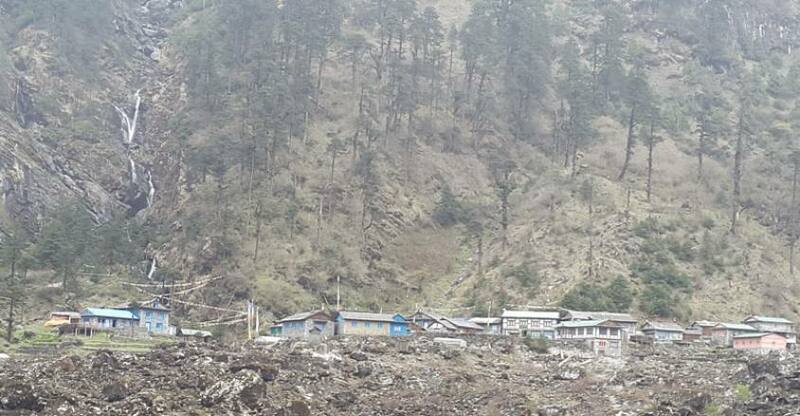 As large numbers of Sherpa people live in Solukhumbu, therefore it is popularly known as Sherpa village. overnight at teahouse. The beginning of your trek is gently ascent for early one and half hours to Tak Shindo La Pass (3100m. ).From this place, you could see first view of Thamserku (6623m. ), Kantega (6780m. ), Kusum Kangaru (6370m.) and Mera Peak (6650m.) Now the end of your trek is steep descent to the town Nunthala (2200m.) through small Sherpa settlement and forest, overnight at teahouse. From Nhuntala the descent continues to the Dudh Kosi (‘ Milk River ’) and cross this river using a 109m long suspension bridge (1510m). Our trek then climbs out of the river valley through fields of barley, wheat, and corn to the sprawling khaling Rai village of Jubing (1680m). We continue to climb up a ridge to a Sherpa village named Khari Khola (2010m) overnight at teahouse. Today, we turn away from the Everest Trail (which heads uphill to Bupsa and the Khari La). Instead, we head in a south-easterly direction, following a straightforward and at times zig-zagging trail which gains height steadily and takes us close to Lenjikharka. We reach our overnight halt at the village of Pangkongma (2850m) in time for a late lunch. overnight at teahouse. A great day of trekking which begins with a climb up to the Pangkongma La (3174m) on the main watershed separating the valleys of the Dudh Kosi and Hinku Khola. 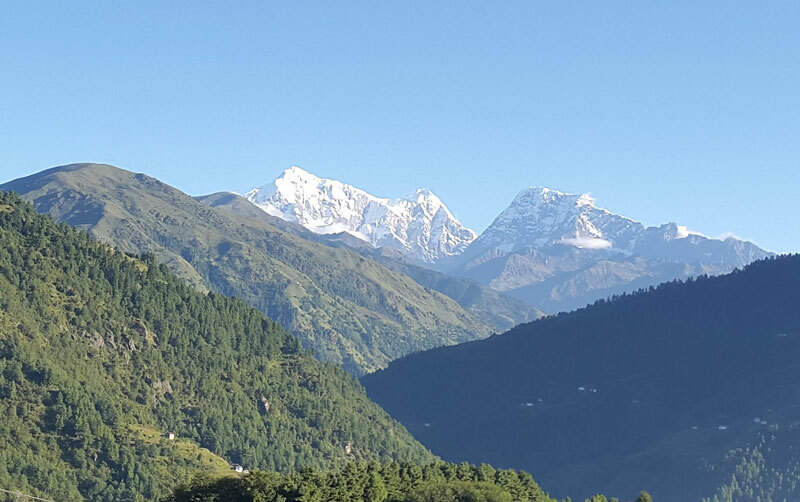 We have our first sight of Mera Peak such as Sanu Himal, Mojang Himal, and Mera Himal. overnight at teahouse. We have a steep climb up to a tea house at 3280 meters, which affords tremendous views. We then continue to climb to our high point of the day at 3350 meters, before a steep descent back to the river and a welcome lunch stop. After lunch, we have a roller coaster afternoon through the forest with some steep sections of trail. At the end of the day, we cross the river on a remarkable bridge made from a huge tree trunk to reach. overnight at teahouse. Heading north we follow the Hinku Khola through the moss-covered trees with many ups and downs as we negotiate side valleys and rock ridges. Our overall elevation gradually increases and finally, after crossing a broad ridge of mixed forest, we reach a sandy boulder-choked area known as Gotay at an altitude of 3600 meters. There are several seasonal lodges and shops here in this otherwise uninhabited part of the Hinku Valley. overnight at teahouse. This day is for acclimatization. It is very necessary for the further trekking. At this point, you will find yourself surrounded by the superb view of stunning overnight at teahouse. Following the west bank of the Hinku Drangka northwards, the forest eventually disappears and the valley widens and becomes much more open. 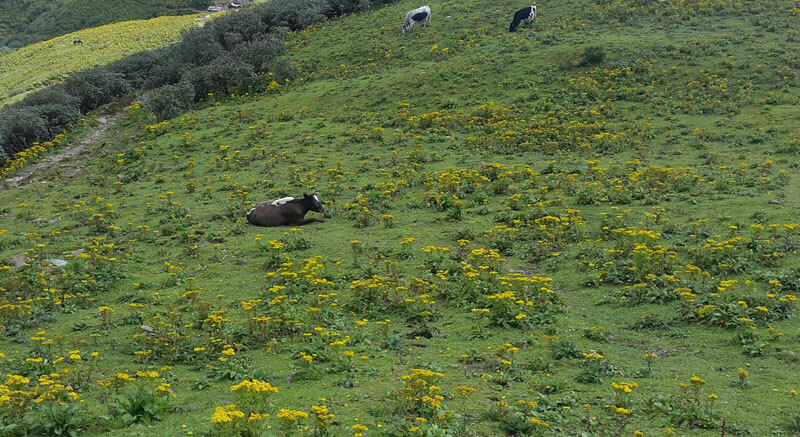 There are no villages in the Upper Hinku, only small kharkas used for grazing goats, sheep, and yaks. The twin summits of Kusum Kanguru appear on the left while the valley is bounded on the right by the steep rock face of Mera's satellite peak. Ahead framed in the sharp V of the valley is the imaginatively named Peak 43. We will take lunch at Gondishung, a summer herders’ settlement consisting of a few roofless huts and stone-walled enclosures, as well as a long ancient ‘mani’ wall of intricately carved prayer stones. Beyond Gondishung we pass nearby a fascinating 200-year-old gompa built beneath a massive boulder and a number of crude mani walls. It is well worth visiting this gompa to burn some juniper at the shrine, an offering that just might ensure a successful ascent of Mera Peak. From the gompa, it is an hour’s walk over moraines to the yak herders' settlement of Tagnag. Once similar in appearance to Gondishung, nowadays there are several teahouses here. overnight at teahouse. We follow cross moraine of Dig glacier to Dig Kharka. This trail offers breathtaking views of the Charpate Himal. This trail goes up through the moraines and the snout of the Hinku Nup and Shar glacier. Then it climbs up towards our camping site, Khare. overnight at teahouse. Another day for acclimatization. At our climbing guide discretion, part of today may also be used to practice techniques and safety procedures to be used on our climbs. There are some interesting day hikes from Khare. Above camp, it is possible to climb to a high moraine ridge, from where there are good views of the Mera La and the route up the mountain. This will also be a time for final preparation of our equipment and packing of our mountain bags. overnight at teahouse. This trek is relatively short and it offers enough time for acclimatization. This acclimatization gives us energy to Mera base camp. When we reach the Mera La pass, we will come to notice a spectacular view and then we come down and continue to walk towards the Hongu side. We set up our base camp in the moraine, below the ice. We spent the whole night at Mera base camp. We stay overnight at Tent camp. Climbing Mera high camp could be risky if you witness the fresh snow for there are many crevasses. Then, you come near to the top of the rock band and it is marked by the large cairn. We set up our high camp there from where you can observe outstanding views of the world famous peaks such as Everest, Makalu, Cho Oyu. overnight at teant camp. A 2.00 am wake up and after bed tea and a breakfast, the group will put on crampons and rope up before setting out for the summit. One of the great advantages of using our high camp, as well as making for a shorter summit day, is that we will have only around an hour of walking with head torches before dawn breaks. Climbing mostly easy angled snow slopes to the foot of the dome of the central summit, we will place a fixed rope for the last 30 to 40 meters. which steepens to an angle of 45 - 50 degrees. Note that in certain snow conditions an ascent of the Central summit may be beyond the technical grade for this trek and in this case, the group will make an ascent of the easier and slightly lower south summit. The trip leader will make this decision. From either top, the panorama of the Himalaya including five of the world’s highest peaks is unforgettable. From our high camp, a well-acclimatized party will take 3 to 4 hours to the summit. From the summit, we will descend first to our high camp for some tea or soup and from here down to the Mera La and all the way back down to our advanced basecamp at Khare. A long but inspirational day! overnight at teahouse. After then Mera peak summit your body will be tired and Halesi Treks Pvt.Ltd organize helicopter Khare to Lukla during the helicopter flight Khare to Lukla you will see the Himalayan range from very close and late afternoon you will reach Lukla. Khare to Lukla By Helicopter trip will be fantastic. Overnight at hotel. Early in the morning, you will fly back to Kathmandu. Afternoon you can do sightseeing tour around the Kathmandu or rest in the hotel. evening farewell dinner party at typical Nepali restaurant Overnight at hotel in Kathmandu. Kathmandu - Phaplu ( Lukla - Kathmandu flight may be delayed by few hours or even canceled due to bad weather condition. So, you should be prepared for such flight delays or cancellations. But we will do our best to avoid such conditions. In case of flight cancellation, we will try to get you on the flight for the next day. Getting early flight for the next day may not be possible during the high season so, we can arrange flight by helicopter as well but it will be an extra cost. 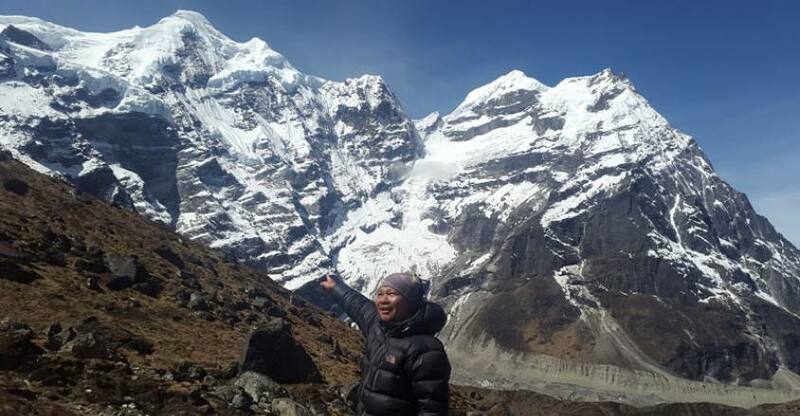 If we have a group of 4- 5 people, we can charter a helicopter from Kathmandu – Lukla. It will be advisable to have extra days in Kathmandu before and after the trekking. We can arrange you cultural / adventure tours (such as sightseeing tours, rafting, jungle safari, with extra cost if the extra days are not used for the flight conditions to Lukla and back. The below-given cost is per person and the below-given Phaplu to Mera Peak Trekking and Climbing fixed departure dates are available for you. If the given date is not favorable then please contact us and we will happily customize your trip on dates more appropriate for you.